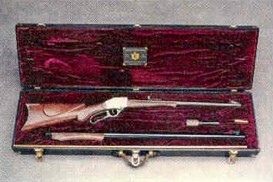 Add a classic rifle to your collection with a rifle from Fenris Wolf Arms in Red Oak, Oklahoma. We specialize in building custom single shot rifles. We take our design cues and inspiration from the best fire arm ideas of 19th century and beyond. By adding a few custom touches and internal concepts, we create the best single shot rifles available. One excellent and functional feature is the Stevens Semi Take Down Screw that allows you to take the rifle down into two pieces. This makes for easy storage in small areas such as a backpack. Another great feature is the ability to use any number of different barrels that you care to order. Each rifle is hand built individually to your specifications keeping in mind the intended use. We ensure the action is inherently accurate by making certain that the face of the breach block and face of the front of the receiver are parallel to within 1,000th of an inch. Contact us to receive answers to your questions.